An Ohio man who drove into a crowd of counterprotesters at a white nationalist rally in Virginia last year, killing one woman, was found guilty of first-degree murder and all other counts. James Alex Fields Jr., a self-described neo-Nazi, drove from his home in Ohioto join white nationalists at a "Unite the Right" rally in Charlottesville on Aug. 12, 2017, killing Heather Heyer and injuring dozens of others. After the violent clashes died down, he sat in his Dodge Challenger watching the counterprotesters for a moment before putting the car in reverse to get a little more distance, putting the car in drive and plowing into the crowd. No one disputed he was the driver, but prosecutors and defense attorneys disagreed on his intent. 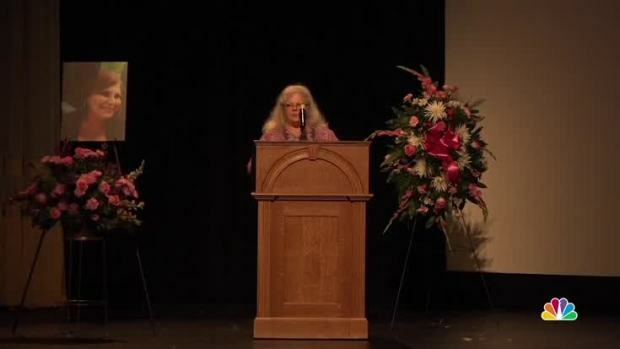 The mother of Heather Heyer speaks at her daughter's memorial service: "They tried to kill my child to shut her up. Well, guess what? You just magnified her." The defense said Fields had urine thrown on him and had witnessed violent clashes between the two sides earlier in the day. When he spotted a large crowd of counterprotesters around two other cars, he thought he would be attacked and feared for his life. Prosecutors said no one was near Fields' car when he slowly backed up, then sped into the crowd, tossing bodies into the air. The jury decided the defendant had an intent to kill. Jurors also convicted Fields of eight other charges, including aggravated malicious wounding and hit and run. Fields showed no reaction to the verdict. The decision sparked celebration in Charlottesville. "Could not be more ecstatic," said victim Wednesday Bowie, who was thrown up against a truck by Fields' car, breaking her pelvis in five places. "They tried to throw out my case specifically, and I’m glad the jury saw through that, and this is the best I’ve been in a year and a half." After the verdict, a group gathered outside the courthouse and chanted, "Whose streets? Our streets!" That is the chant counterprotesters were using the day Fields drove into the crowd. Heyer’s mother declined to comment Friday evening, but she will be speaking about the impact of the loss of her daughter in the sentencing phase which begins next week. Fields' mother, Samantha Bloom, who is disabled, left the courthouse in a wheelchair without commenting. A group of about a dozen local civil rights activists stood in front of the courthouse after the verdict with their right arms raised in the air. "They will not replace us! They will not replace us!" they yelled, in a response to the chants heard during the 2017 rally, when some white nationalists shouted: "You will not replace us! and "Jews will not replace us." "We don't stand for this type of hate. We just don't," she said. "I am sadly not shocked, but I am appalled by this," he told The Associated Press. "He was treated as a terrorist from the get-go." Spencer had questioned whether Fields could get a fair trial since the case was "so emotional." "There does not seem to be any reasonable evidence put forward that he engaged in murderous intent," Spencer said. The jury will reconvene Monday to recommend a sentence. Under the law, jurors can recommend from 20 years to life in prison.